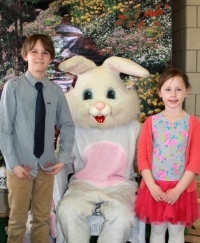 Nolan and Delia Jablonski enjoying last year's event with the bunny! 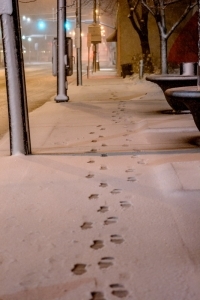 Are you trying to keep those whimsical childhood dreams alive for your child as they grow up? Or maybe you just want to see how your baby will react to the Easter bunny for the first time and catch a funny snapshot! Either way, the best way to embrace those pivotal moments of childhood is to join other Lakewood families on Saturday, April 13th at this year’s Breakfast with the Bunny, hosted by H2O! H2O, or Help to Others, is Lakewood’s very own unique service program for high school and middle school students that connects them with their community through volunteerism. This event is run by volunteers, and all of the servers will be Lakewood high schoolers donating their Saturday morning to assist at this event. They will be serving up pancakes and sausage at the Women’s Pavilion at Lakewood park. 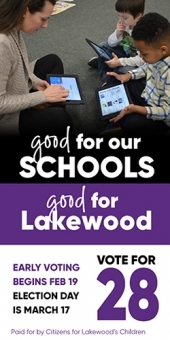 So come wake up with some coffee provided by Lakewood’s well known Root cafe, and see why Lakewood is a thriving, vibrant place to raise a family! This event has seating times at 8:30 a.m., 9:45 a.m., 11 a.m., and 12 p.m. Get your reservations soon as this event may sell out! The cost is $10 per adult and $5 per child. Photos will be available with the Easter bunny for $5. Enticing raffle baskets donated by local businesses will also be on display for a chance to win fun prizes! Visit www.thelakewoodfoundation.org/h2o for reservations by April 10th. A special thanks to First Federal of Lakewood, who has generously sponsored this event, so that more proceeds can benefit H2O. Hope to see you there!